Beginning a platform release February 18, “The Last Lions” joins a number of extreme survival stories. Filmmakers Beverly and Dereck Joubert, longtime chroniclers of Africa’s wildlife, have shaped the Botswana-set saga for maximum dramatic impact. Watch The Last Lions trailer – and make a difference for lions! For every trailer viewing, National Geographic will contribute $.10 to lion and big cat conservation in Botswana. Watch as many times as you want, and share with your friends and family. Bangalore: An 18-month-old child was killed by street dogs in the wee hours of Wednesday. Around 5am, a snarling pack of 15 stray dogs dragged the sleeping 18-month-old S Prashanto out of his hut and mauled him to death near Bagalur off the Bangalore International Airport road, TOI reported. Police arrested Gonti Yadav alias Chandrasen, around whom the stray dogs live, and charged him under IPC sections 289 and 304 (A), which deal with negligence towards animals. Police also caught one of the stray dogs which mauled the baby. “We’ll hand it over to BBMP officials” said inspector Babu Anjinappa. And I wonder what the officials will ‘officially’ do with the canine — banish it to a lifeterm in prison or hang it till death? Although the authorities are keen to terminate the menace of canines and clear the streets of them, animal rights groups oppose any such move. I wonder why. I don’t know how to avoid such incidents or induce social responsibility, but after reading such a story for the umpteenth time, I just wanted to ask one question to those animal lovers who stop the government from taking any measure — Whose life is more important for you? A street dog’s or your child’s? PS: A billboard near Chinnaswami Stadium reads: “Save your children from stray dogs”. Is that all we can expect from the authorities? Ending months-long speculations that Nissan is readying a ‘Micra Sedan’, the carmaker has unveiled its all-new Global Sedan at the 8th China International Automobile Exhibition. 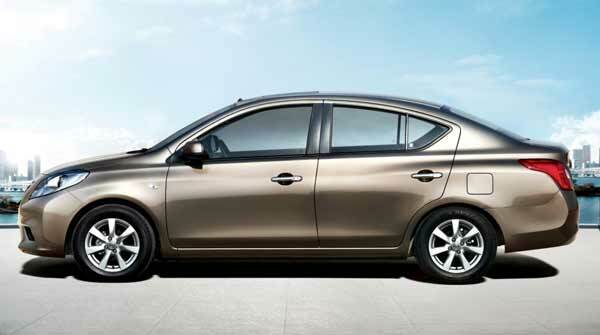 The new sedan, Nissan Sunny, will be built on Nissan’s versatile ‘V’ platform, but is not a Micra sedan. Sunny will be launched in India in the second half of 2011. However, the name Sunny is only for China market and its name in India is yet to be finalized, Nissan says. The new sedan will be powered by the 1.5-liter HR15DE engine with dual injectors and a new-generation Xtronic CVT with an auxiliary transmission. Sunny is supposed to deliver superior handling and better environmental performance as a projected class leader in fuel economy as well. From the pictures released by Nissan, one thing is very evident – Sunny is sure to allure young generation looking for a medium sized sedan that combines a dynamic upscale design with the space and quality. Don’t judge a book by its cover. This is exactly what I was thinking while test-driving the Micra Diesel over the weekend. Nissan Micra may be a tiny car for many, but only in the appearance. It is as big as, or even bigger than, any other contender in the segment. The diesel variant powered by a mighty 1.5-litre 63bhp unit borrowed from the Renault Logan, makes the diesel Micra a cute little monster indeed. And it’s worth the customers wait – especially those who ask for the diesel variant as soon as the petrol version is launched. Thankfully, Nissan didn’t keep its customers waiting too long. Within six months of the petrol variant launch in the Indian small car market, Nissan introduced the diesel variant. At first glance, you will hardly see any difference between the petrol and diesel Micras. But, the diesel variant comes with 15-inch alloy wheels and rear spoilers, which are missing in the petrol variant. Inside, it gets leather wrapped gear-knob and steering wheel with a chrome logo on it. Otherwise, everything else remains the same. Nissan is offering two diesel variants – XV and XV Premium. Interestingly, both sport all exciting USPs of Micra such as Push Button Ignition, Keyless entry, Auto-fold door mirrors and driver air bag. The lower variant just lacks the 15-inch alloy wheels, auto air conditioning, rear spoiler and fog lamps. One big disadvantage of the diesel Micra, though, is that it doesn’t have ABS even as an option. To cut further costs, Nissan has also decided not to offer passenger airbag on the diesel variants. Looks like safety measures aren’t top of mind this time. But such minor deterrents can be quickly forgotten once you experience the drive in this little monster. Simply push the Ignition button and the car comes to life not with a roar, but with a whisper. Yes, you can barely hear the engine inside the cabin. Although there’s a fair amount of turbo lag as you start moving, things change in seconds and the Micra flies like a champ. You’ll be amazed at the lightness of the power-steering at just 9.3 metres turning radius, which makes city-driving fun. Under the curvy bonnet is the 1.5-litre CRDI K9K Diesel Engine that delivers 63bhp at 4000rpm and 160 Nm of torque at 2000rpm. It is mated to a 5-speed manual gearbox. 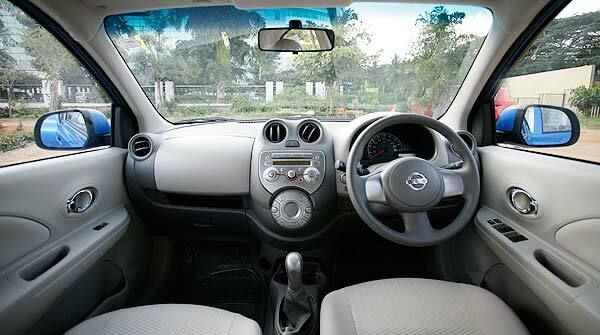 The gearshifts are moderately smooth but the clutch is tougher compared to the petrol Micra. The third gear, however, offers a wide enough power band which translates into less gearshifts in city traffic. 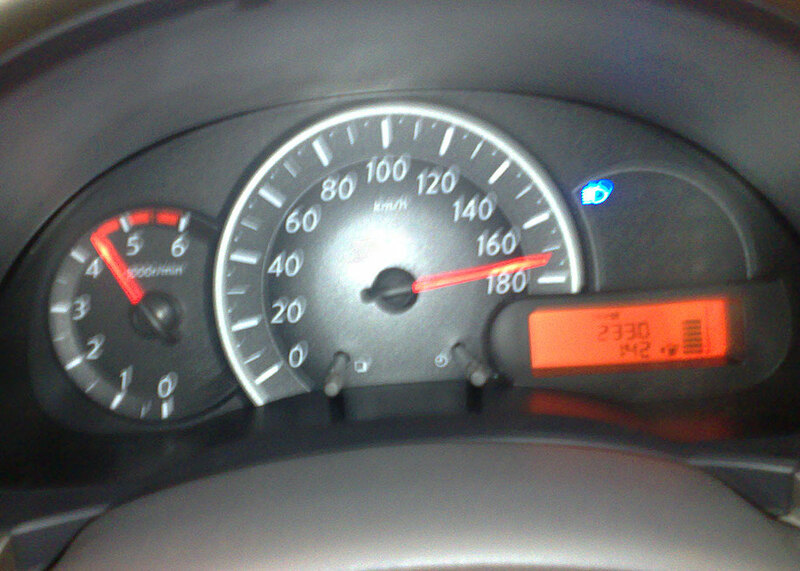 On the highway, the car is a true performer as it seamlessly goes past 140 km/h but after that the engine starts gasping on to a maximum speed of 170+. However, the Micra is incredibly stable even at higher speeds, thanks to good aerodynamics brought togetherby the uniquely shaped cabin with a slightly raised roof end, plus rear spoiler. The compact suspension built for the V-platform absorbs plenty of punishment meted out by our roads although there is some amount of body roll and thumps and thuds. Braking is not that great, either. The most disappointing part of the Micra is its rear seat. Although the car offers best-in-class leg, shoulder and headrooms, the seats lack proper cushioning, thigh and shoulder support. There is no head support, either. Nissan needs to seriously re-look at this feature, I’d say. Nissan Micra is a package of many ‘firsts’ and best-in-class features, so one isn’t surprised at the breakthrough in terms of fuel efficiency. Leaving all its contenders behind, the diesel-powered Micra delivers 23.08kpl (ARAI certified) – which essentially means one tankful will probably last you till the end of time. The XV variant is priced at Rs 5.58 lakh while the XV Premium will cost Rs 6.04 lakh (ex showroom, Delhi). Of late, Pope Benedict XVI has earned the title of ‘Green Pope’ for his continuous efforts to reduce environmental footprint. He had photovoltaic cells installed on the roof of a Vatican auditorium in 2008, followed by a solar cooling unit to the Vatican cafeteria. Now, Pope Benedict wants to take another step towards a greener environment with a solar-powered Popemobile. The Vatican says that a solar Pope transporter would be a rolling tribute to the Pontiff’s message to promote sustainable energy. According to sources, German-based firm, SolarWorld, has offered to fulfil the Pope’s dream, but chances are very less that they get thumbs up from the Vatican security apparatus. The prime concern will be how fast a solar Popemobile can take off if there are any security incidents. However, SolarWorld marketing chief Milan Nitzschke said that electric cars can accelerate just as quickly as traditional cars, and can go from 0-100 km/h in three seconds. Whether or not the Pope’s dream comes to a reality, his care for the planet and promotion of sustainable and green energy have been lauded among the religious as well as secular community. One of the most iconic vehicles in the world, the current popemobile is a modified Mercedes Benz M-Class SUV. Toyota finally made its entry into the highly competitive B Segment in India with the launch of the Etios sedan. Developed specifically for Indian customers, the Etios ranges between Rs 4.96 lakhs and 6.86 lakhs ex-showroom New Delhi. Along with the sedan Toyota also took the wraps off its hatchback sibling called Liva, which will be launched on April 11th. Available in four variants, J, G, V and VX, the Etios is powered by a 1.5L, 16V DOHC engine mated to a 5-Speed manual transmission. Etios boasts of innovative styling, best-in-class cabin and luggage space and impressive mileage of 17.6kmpl (ARAI tested). The Etios has various active and passive safety features such as energy absorbing body shell, driver & passenger air bags and ABS with EBD. Bookings have already started, but delivery will begin only in January 2011. For us Indians, there was a time when the word ‘car’ meant only Ambassador. Regardless of whichever luxury car you drive now, you can never forget those moments of comfort you enjoyed in an Amby, right? But Ambassador failed to survive amid the revolution in the Indian automobile industry. Before Amby ended up in heritage car lovers’ garages, Hindustan Motors decided to act. They are coming up with not just one, but four new variants of the car that was once the favourite of India’s politicians and bureaucrats. Although HM had made couple of not-so-successful efforts to revamp the iconic car, their tweaks were limited to just interiors and powertrains. The exterior design always remained the same and the retro looks failed to impress the GenX. Finally, the company has decided to give a complete new look to Amby and has roped in Pune-based design firm Onio Design for this purpose. The first variant would be ready by December. All the new variants of the Ambassador will be available with an engine size ranging between 1500 cc to 2000 cc. Meanwhile, HM will work equally hard to preserve the traits of the Amby which is space, comfort and ease of maintenance. Do you think the rejuvenated Amby can regain the lost charm?